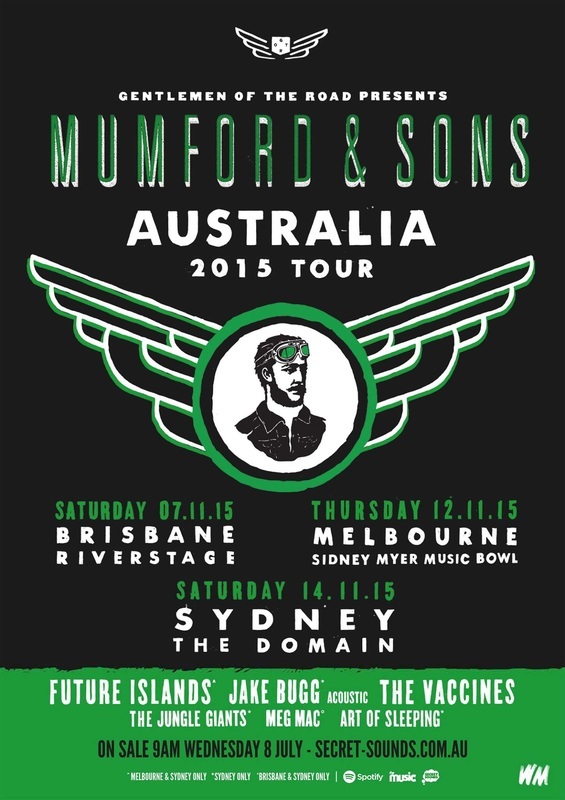 Mumford & Sons will be heading back to Australian shores this November to play a handful of shows across the country. The band will return to the stunning surrounds of Brisbane’s Riverstage, and will play their biggest local shows to date at Melbourne’s Sidney Myer Music Bowl, and a very special Gentlemen Of The Road event at Sydney’s Domain. In 2014 the band returned to the studio for some writing sessions at Aaron Dessner's (The National) garage studio in Brooklyn, New York, before laying down tracks with producer James Ford (Arctic Monkeys, HAIM, Florence & The Machine) in London. They released their third studio LP Wilder Mind earlier this year. Marcus Mumford has described Wilder Mind as 'a development, not a departure' as the band expand their musical horizons whilst retaining key elements of their sound. Mumford and Sons have had a long and prosperous relationship with Australia, we fell in love with the Brits right before the rest of the world cottoned on. 2009’s Sigh No More drew us in, 2012’s Babel got us hooked, and 2015’s Wilder Mind is continuing to deepen our fascination. It flew into the ARIA charts, giving the band their first Aussie #1 week of release. The latest video for their single The Wolf charts the band over 48 hours at the 2015 Bonnaroo Music & Arts festival in Tennessee in the USA. The band spent the beginning of the year performing intimate shows for fans in Berlin, London, LA and NYC, and are now in the middle of a world tour, playing huge headline shows in major cities around the globe. Earlier this year they also announced the return of their personally curated two day Gentlemen Of The Road Stopover Festivals in small and unique towns in the UK and USA. They are being joined by friends like The Flaming Lips, My Morning Jacket, Ben Howard, Primal Scream, James Vincent McMorrow, and rock superstars The Foo Fighters. Joining them as an exclusive Australian appearance, in the Domain will be UK singer songwriter and 2015 NME solo artist of the year Jake Bugg. At the tender age of 21, he has multiple platinum selling, chart-topping records, critical acclaim, sell out tours and a career trajectory most young musicians can only dream of. Maryland synth pop collective Future Islands, whose epic live shows have been commanding attention from music lovers world wide, largely thanks to the astonishing performance antics of frontman Samuel T Herring. His unique delivery mesmerising live audiences everywhere they go. Adding a splash of indie pop rock to the line up are fellow Brits, The Vaccines, the darlings of the UK music critics thanks to their time warped tunes that take heed from the 60’s, 70’s and 80s, delivered with dose of 2015 London. Local heroes The Jungle Giants will hit the stage at the Domain fresh off the back of touring their second album Speakerzoid. From teenage sensations to accomplished road warriors, their indie rock tunes have made them you tube sensations and triple j favourites. You would be hard pressed to find anyone who wasn’t totally bewitched by the voice of Melbourne’s Meg Mac, the Air Award and 2014 triple j Unearthed Artist of The Year award winner, brings her intoxicating live show to sweeten up the Domain. Brisbane’s Art Of Sleeping will open the day with their signature expansive folk rock, with multiple singles floating about the airwaves, and a string of glowing reviews for their recent headline shows, they provide the perfect avenue to ease your way into a day long musical feast.